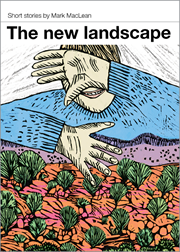 The New Landscape is a collection of short stories first published in 2009. The final piece in the collection, Unte nthenharenye?, was runner up in the David Harold Tribe Fiction Award, hosted by the University of Sydney. Find out more about Five Boxes, A Year Down the Drain, The Oldest Man in the Universe Goes to Groovin' the Moo or A Short History of Ireleth & Askam-in-Furness.